Friends of Geography (FOG) is a Portland State University student group that strives to provide a forum for undergraduate and graduate students interested in geography to share ideas, socialize, and learn! FOG sponsors a variety of events, such as: geography-themed field trips and hikes; colloquia; and overnight adventures around Oregon. Please sign up for our Listserv to be notified about upcoming events, or check out our events calendar. FOG is having it's Fall Map Sale on Tuesday, December 1 from 9am - 4pm in the hallway of the Geography department on the 4th floor of Cramer Hall. The map sale is a fundraising event for Friends of Geography, where we sell the maps that have been donated over the years. We'll have maps, maps, and more maps (typos, aerial photos, wall maps, and some really interesting rare and unique maps), but also some books, atlases, and other geographic oddities. You never know what you might find!! Learn about the biogeography and geomorphology of Mount Hood! FOG is organizing a long half-day trip on Friday, May 29th to (most likely) head up Mount Hood and learn about biogeography, ecology, soils and geomorphology. We plan to rent a van, so make sure to RSVP so we know who wants to go. Although at this point the specific itinerary is still to be decided, we need to know the number of participants and whether to rent or carpool. 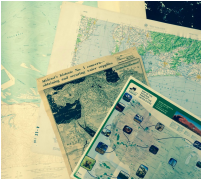 Friends of Geography will be having a Spring Map Sale on Thursday, May 14 from 10am - 3pm in the hallway of the Geography department on the 4th floor of Cramer Hall. The map sale is a fundraising event for Friends of Geography, where we sell the maps that have been donated over the years. We'll have mostly maps (topos, aerial photos, wall maps, and some really interesting rare and unique maps), but also some books, atlases, and other geographic oddities.